Bendy plastic displays might actually arrive in a year or two - HP has developed a prototype of a flexible display screen with Arizona State University's Flexible Display Center. Flexible displays could be pulled out from a PDA-like device to provide a viewing area larger than the device itself. They could also be used as a form of paper, signage, or as displays stretched between supports for a meeting and then rolled away and packed up. Making them is difficult because the flexible material obviously moves, meaning it deforms, and this makes it excessively difficult to add precisely aligned display components to it and ensure they stay aligned and don't become unstuck. The HP display is crafted like a tape ribbon but in wider rolls. Roll-based manufacture is cheaper than sheet-by-sheet manufacture. A flexible plastic substrate is the starting point. This is flexible Polyethylene Naphthalate (PEN) from DuPont Teijin Films. HP then layers a thin film transistor array on this using a self-aligning imprint technology (SAIL) method. HP says it produces perfect alignment irrespective of any process-induced distortions in the substrate. Then E Ink’s Vizplex imaging film is integrated to produce an actively addressed display. This is a bi-stable electrophoretic imaging material and it enables images to persist without applied voltage - it uses reflected light for viewing - and so lowers electricity usage. 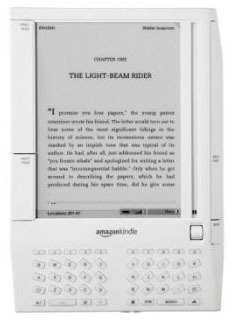 The flexible display is monochrome and the same E-Ink material is used in Amazon's Kindle reader as a form of e-paper. In that device it has 4 grey-scales and the screen is basically light grey with darker grey text. It suffers from a lack of contrast compared to desktop, notebook and smartphone display screens. E-Ink does have a Vizplex film with 8 grey-scale levels, but not colour. An HP statement says: "Mass production of such [flexible] displays can enable production of notebook computers, smart phones and other electronic devices at much lower costs since the display is one of the more costly components." This is not really true as the HP bendy screen is a four- or eight-greyscale monochrome display lacking in contrast compared to the bright colourful screens we are all used too and few people would buy an HP notebook if it had such a crap screen.